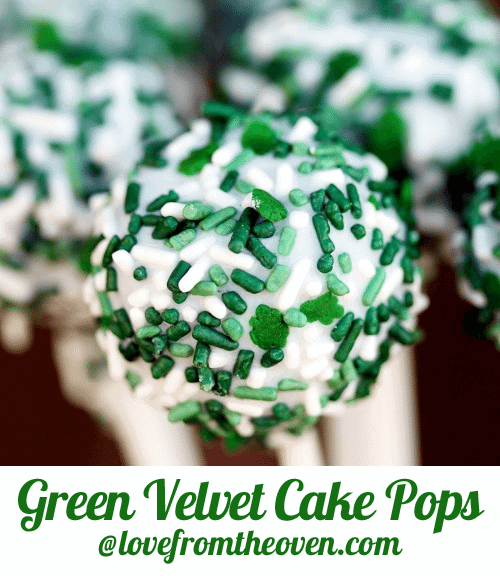 These fun Green Velvet Cake pops are perfect for St. Patrick’s Day! These are festive, colorful and, most importantly, delicious. I made these with my green velvet cake recipe. 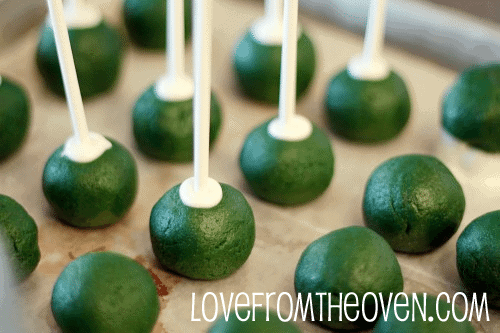 This is my final treat from the green velvet cake recipe is green velvet cake pops. Super cute! 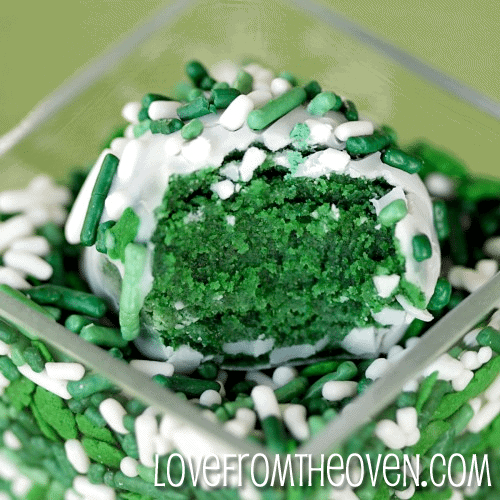 I think most people will be quiet surprised when they bite into the cake pop and see the vivid green color. 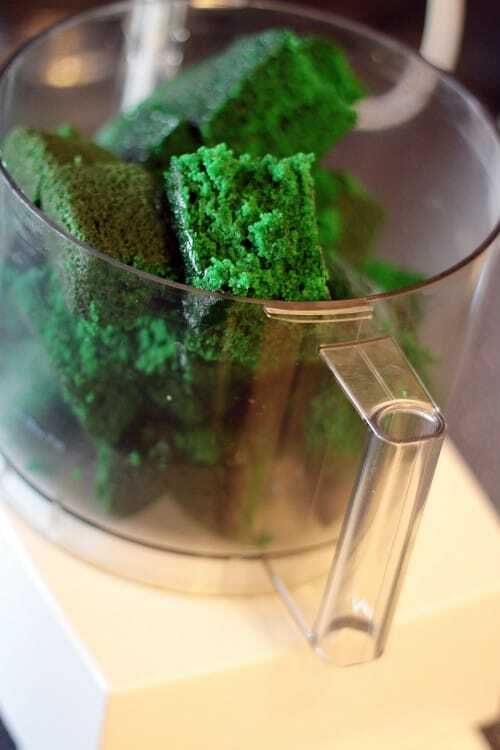 Once you’ve made your green velvet cake, let it cool. I actually cooled mine and than wrapped it in plastic wrap and stored in the fridge for a day before making my cake pops. This was a nice way to break up the time it takes to make these. Cut your cake up, and either shred it with a fork or pop it into your food processor. It only takes a couple of pulses and you have cake crumbs. Even though I made homemade cream cheese frosting, I decided to use canned frosting in the cake pops. I didn’t want to have to store them in the fridge, so shelf stable frosting made sense. I put a big scoop in (I always start out with a little bit and add in as needed, to make sure I don’t over do it) and gave it a few more spins in the Cuisinart. 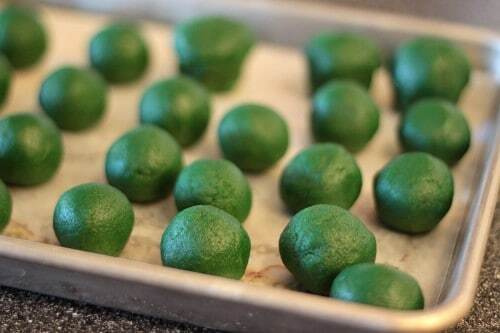 Now you will want to make your cake balls. You can use a scoop, though I just shape mine by hand. thn I put the sticks into the cake balls, and let the chocolate set up. After the chocolate sets up, I than dip the cake balls into the chocolate, and than cover with pretty pretty sprinkles! I love me some sprinkles. 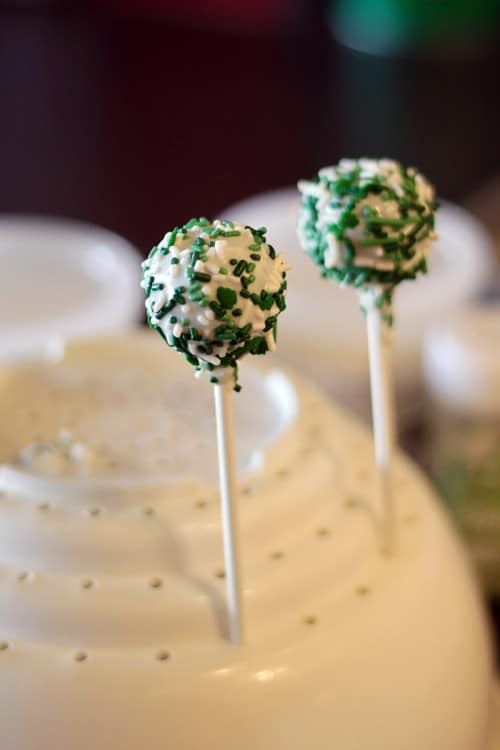 I made both cake pops and cake balls – same thing, the only difference being the stick. See my fancy cake pop stand? And here all I thought it was good for was draining water. 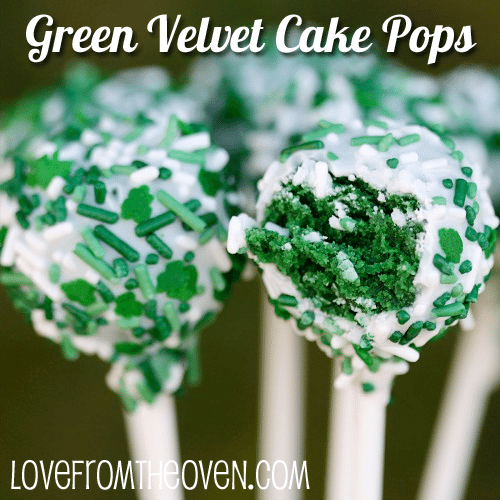 And now you have super cute green velvet cake pops and green velvet cake balls. I found these cute little tins at Michaels for 49 cents. 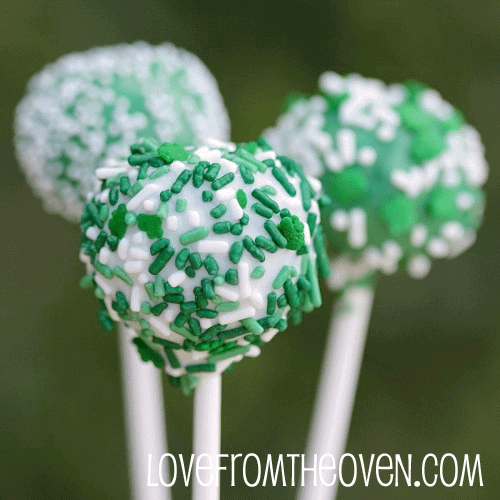 Add a bow and they are perfect to use to give your cake balls as a gift. And a few more pics. 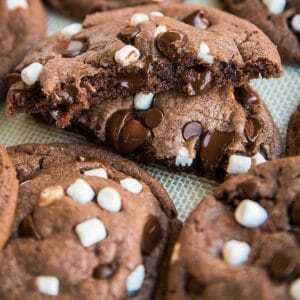 I think these may be my favorite treat out of all of the green velvet recipes. 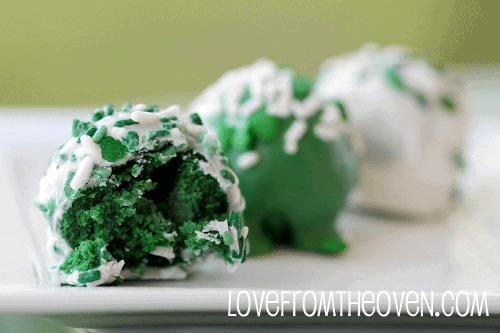 Certainly a super sweet St. Patrick’s day treat! Oh my these are so stinkin cute! Love all the pictures! Amanda – thank you so much, I’m happy I could share a few tips with you. I’m no expert, but hopefully I can at least share what has, and has not, worked for me. Yes, please do give them another go. 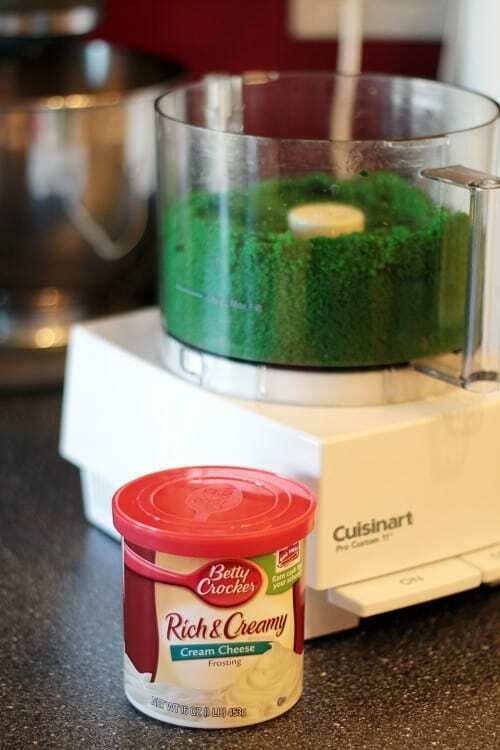 I see a lot of recipes for a can of frosting, and I will say I’ve never used more than half a can. I start with as little as a quarter can, than add a bit at a time. Sure, some recipes make need an entire can, but if you have a really moist cake, you just don’t need so much. 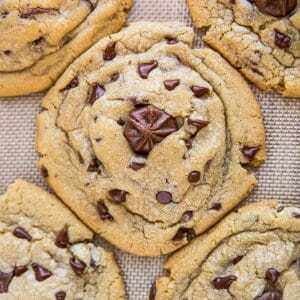 Just do a little at a time, and than try to make a ball with the dough, and go from there. Good luck, let me know how your next ones turn out! That deep, green color is gorgeous. 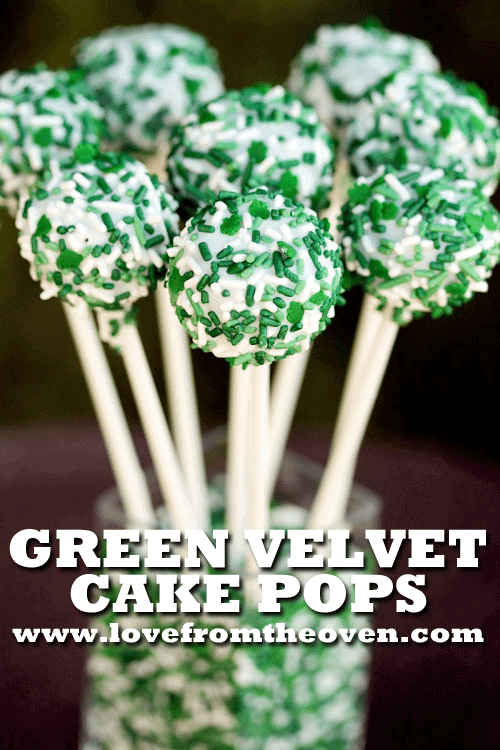 And your cake pop stand = genius! Heidi – quite the stand, isn’t it? 🙂 If only it could pretty itself up and make itself a bit more presentable on buffet tables! To display cake pops (or cookie pops) I buy florist foam, stick it in a cheap flower pot and used shredded tissue or florists moss. Looks like a cute garden! These are simply adorable. 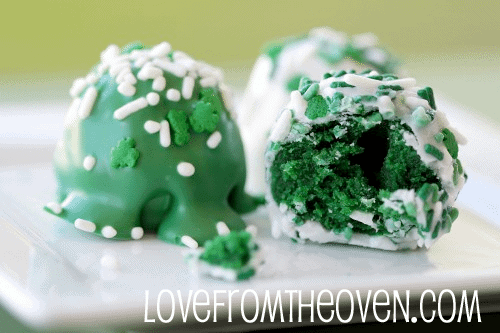 Most cake ball recipes seem so hard and full of time consuming steps, but yours seems so simple! I can’t wait to try this next time I get the urge to whip something up in the kitchen. Thanks so much Lauren! I agree, so many recipes I look at and think that they will be too much work or I will screw them up, and one of the things I hope I can do on my blog is show that some of this stuff really is pretty simple. It’s amazing what you can create with some dipping chocolate and pretty sprinkles! These are SO cute!! Love everything you did!! I love these pictures! Just gorgeous! Gorgeous color! They look delicious! I’m making these next week for my dayghter’s preschool class! Question: Can I use Bakers chocolate squares and melt those for the cake pops OR do I have to use Wiltons candy melts? Frances, honestly I would try to either get the Wilton melts, or some almond bark (I usually find this at my grocery stores and walmart/target). I’ve had varying results when using chocolate chips or other forms of chocolate, where the melts and the bark are pretty sure bets. It’s a bit of work to make all the balls for the cake pops, and you certainly don’t want that time and effort to go to go to waste. I’m sure your daughter’s class will love them! 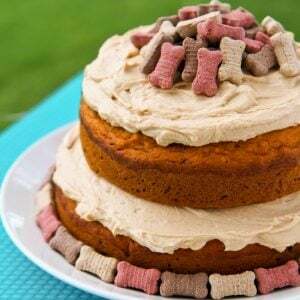 I get so bummed that we can’t do any homemade treats here – all store bought. No fun! these look great but i’m confused! 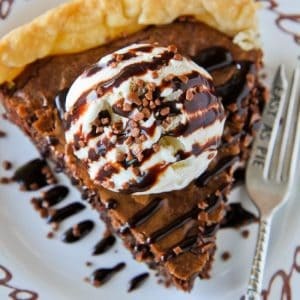 if you dip the balls in melted chocolate, what’s the frosting for? aaaahhh! thank you so much…I completely missed that! 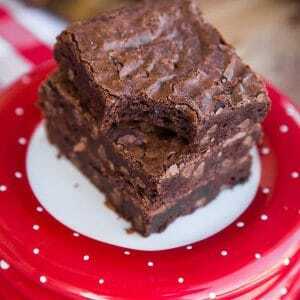 I’m getting the goods for these today so I can make them tomorrow; and I’m pretty darn excited. thanks! so cute! green velvet looks lovely. Hi! Love this idea. I’m making them for both my daughters’ classes. Small problem though. 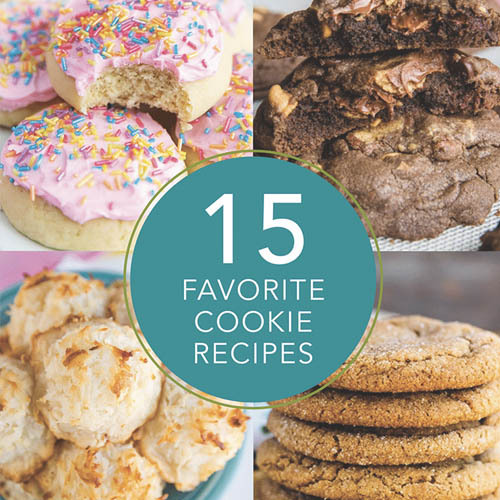 I used almond bark to dip a few but the results are kind of thick and lumpy…. I highly underestimated the step where you put the stick in and let it set up. I went right to the dipping and lost a few good ones. Darn shame! I will know for the next time though! 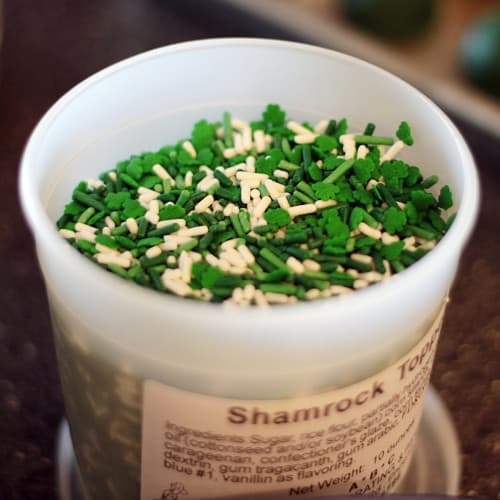 My daughter’s birthday is St. Patrick’s day so always looking for green treats. This is really cool. What did you use for sticks? I thought about using skewers, but I was wondering what you used. These cake pops are beautiful!! I know how to dip the pops, but how do you dip the balls into the chocolate without getting them all messy? I can’t figure it out…..
Oh the green balls look so cool and it was my first time seeing the green ones unlike other kinds. I just like staring into them. 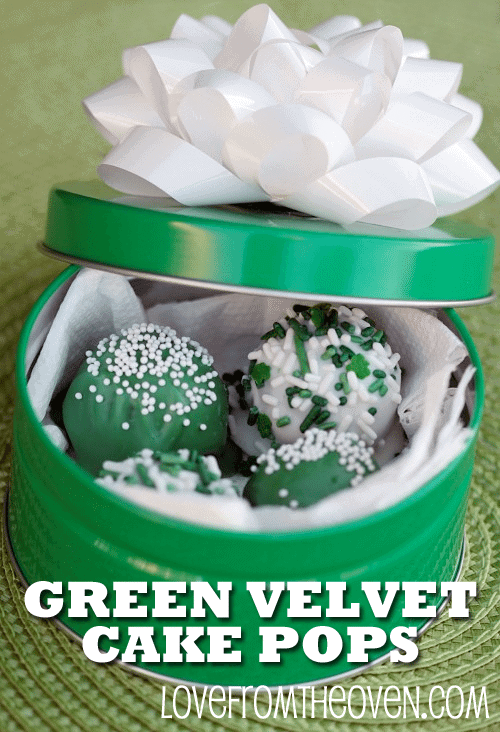 Hi…I love making red velvet cake balls and w/ Christmas coming up I would love to do both red and green cake balls for a holiday party. 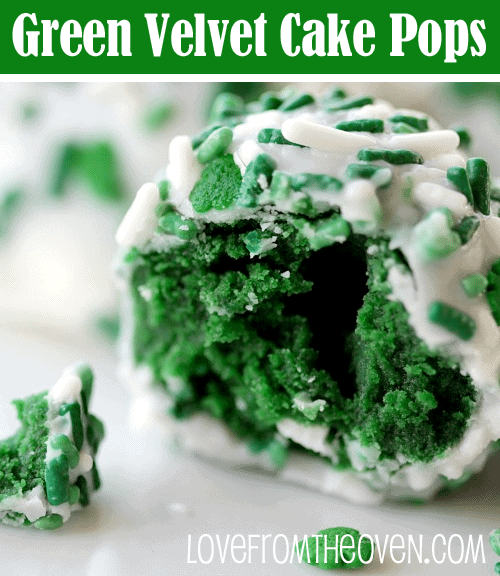 I have never seen green velvet cake mix though (I live in SC), what brand do you use and do you know where you can get the green mix? Thank you!! 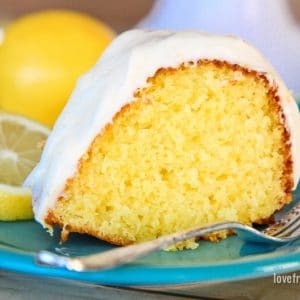 How do you get your cake so smooth when you roll it in a ball?! No matter how hard I try, mine are always bumpy! What a great idea for a stand!! I would have never thought of that.. You are so awesome!! 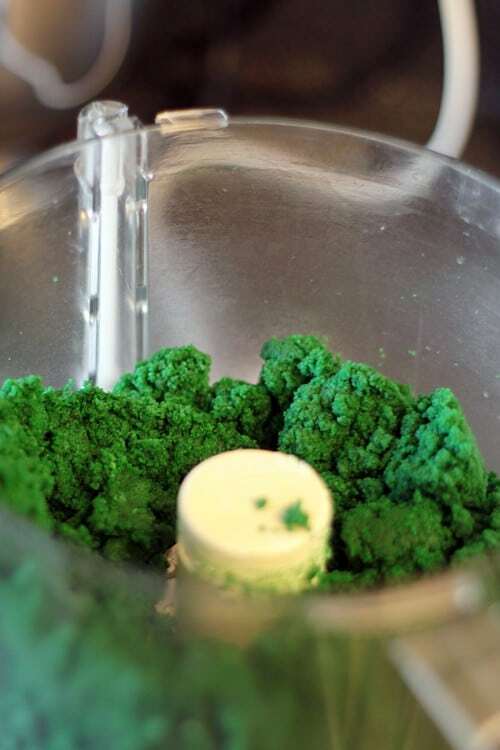 how did u make the green cake ??? how do these taste? do they have that red velvet flavor? How long do they keep for? I was planning on making cake pops for the baby shower i was planning for two of my coworkers. Will they be ok if i made them Thursday for a Saturday shower? Also i am very curious about the babycake cakepop maker. do they have a colored velvet cake pop? 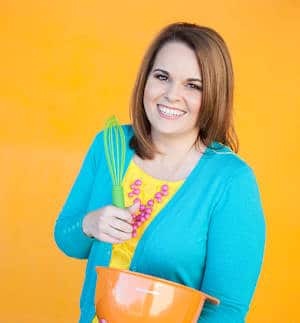 Jenny, Babycakes just came out with a cake pop cookbook. While I haven’t gotten my hands on it yet, I am going to guess that there is a velvet recipe of some sort in there. As for how long they keep, I think Thursday night for Saturday will probably be fine. I couldn’t find how many this makes? Thanks!! I have a cake pop maker that my mom got me for Christmas – haven’t used it yet. I think it’s that babycakes one referred to above in a comment. 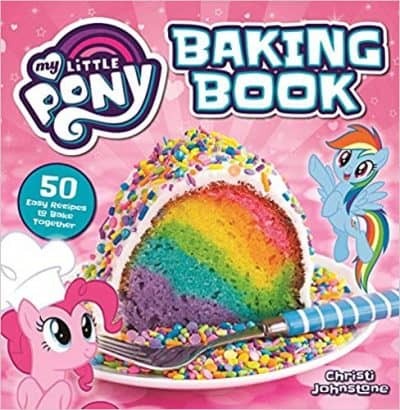 I’m confused how I would use it – looks like you bake the cake separately and then mix with frosting and then they’re done, no further baking. So is there another way to make these things? I want to make these for my daughter’s preschool treats next week! Thanks for the adorable ideas & great pics!! I did everything exactly as it said in the recipe but my cake pops didn’t stay on the stick when I dipped them in the chocolate. It seems they were too oily or something. Does that mean I used too much frosting? A friend of mine was thinking about doing the balls for wedding gifts….do you think they would freeze well? It is the perfect green for her wedding theme. Lisa, they freeze well prior to dipping in chocolate. Then you’d want to let them thaw in the fridge, then dip. The problem I’ve had with freezing them once coated in the chocolate is that they can tend to want to expand and contract and that causes the chocolate do crack. 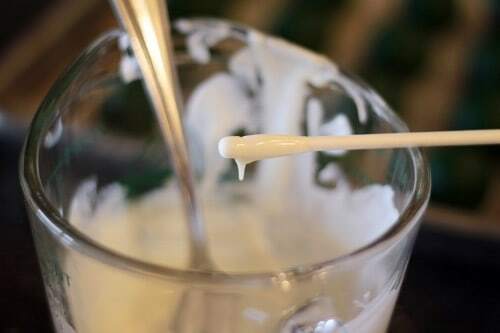 I’m sure someone out there probably has some great advice on this, so many people make large batches and sell theirs (I do not) so I’d check around, maybe even the Wilton.com forum. 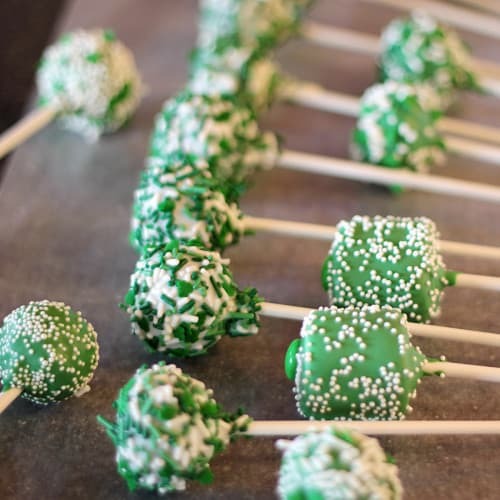 Just reporting in that my Green Velvet Cake Pops were a BIG hit at a party, and with my yoga class. Thanks so much for the recipe and inspiration. I did bake the layers ahead, refrigerate, and then used the food processor – so much easier than mixing by hand, and more uniform results. Thanks again!